Christmas is just a few weeks away. Buying a gift for a beekeeper is actually very easy, but only if you’re a beekeeper yourself. For non-beekeepers, buying bee-related gifts can be puzzling due to the almost-cryptic nature of the hobby. So for anyone wondering what to get their favorite beekeeper, here are my top 5 beekeeping gift ideas for 2018. They span various price ranges, from about $10 up to $200. I avoided pest and disease management products on this list because of the largely divided ethos of treatment versus treatment-free; you wouldn’t want to give a beekeeper a package of miticide and then find out she is passionately anti-treatment. All of these gifts are pretty much controversy-free and would be immediately useful to just about any beekeeper. 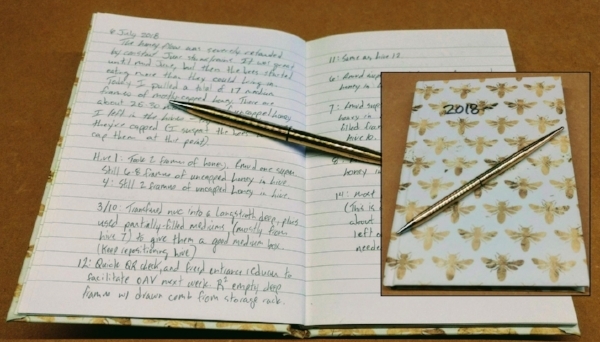 Beekeeping Journal: Beekeepers keep track of things, usually by writing them down. This tracking can be as simple as how many hives they’re currently running, or as complicated as a detailed breakdown of each frame in each hive. Any paper will technically work, and many beekeepers use a generic notebook for their record keeping. But you can spice things up and make this important tool a little more special by getting them a bee-themed journal. $11 with Amazon Prime free shipping. EZ Pry Hive Tool: Every single beekeeper uses a hive tool pretty much every time they work their hives. It’s probably the most-used piece of equipment in a beekeeper’s toolbox, and is critical for cracking open hives, scraping comb and propolis, and pulling frames. I’ve tried a lot of different styles of hive tools, and the EZ Pry is my favorite. It’s on par with other tools for opening hives and scraping boxes, but it excels at pulling frames. The EZ Pry has two extra angles that standard hive tools lack. The resulting Z-shaped bar provides leverage for prying propolized frames out of a hive body, and does it with less damage to the wooden frames than most other tools. Beekeepers are constantly misplacing their hive tool, so if you only get one item from this list, get this one. $17 plus shipping from Mann Lake. Extended Cuff Nitrile Gloves: This might seem odd to non-beekeepers, but hear me out. The inside of a bee hive is a sticky and sometimes hazardous place. Beekeepers are often faced with the decision to either wear traditional lambskin gloves to keep their hands protected, or to work bare-handed. The downside to traditional beekeeping gloves is that, while they offer a lot of protection, they rob you of the ability to make fine manipulations in the hive—imagine dipping mittens in a bucket of glue and then playing Jenga. Bare hands, alternatively, give you a great deal of fidelity in the hive. That is, until your fingers are coated in honey and propolis. Bare hands are also nice targets for angry bees trying to protect their home, so there’s that to consider too. A few years ago, I heard commercial beekeeper and researcher Randy Oliver recommend nitrile gloves as a compromise between heavy lambskin and bare hands. These gloves, in my experience, have been invaluable during hive inspections. If they get too sticky, I can just slide on a new glove. And I’ve only been stung one time through these gloves in three years of wearing them, all while maintaining a superior tactile experience in my hives. $23 for a pack of 100 with Amazon Prime free shipping. Paul Kelly Bee Belt: This is the one product on this list that I don’t actually use myself. It’s definitely a luxury item compared to the other gift ideas. The bee belt by Paul Kelly is more widely used in Canada, but has started gaining some notoriety here in the United States over the last couple years. The best feature of the belt is its ability to hold a hive tool with a built-in magnet. It’s got other pockets and compartments, but the tool holder alone is just about worth the price of admission, in my opinion. I’ve almost bought one of these a couple times, but talked myself out of it for pragmatic reasons (i.e. I can just put my hive tool in my back pocket). In that way it makes a great gift—most beekeepers wouldn’t buy one for themselves, but would love to find one under the Christmas tree. The Paul Kelly bee belt is available in the United States through a couple retailers. $83 plus shipping. Broodminder-W: Weighing a hive offers insight into a few key questions. Is the hive ready for winter? Did my colony swarm? Is there a nectar flow on, or are we in a dearth? Broodminder may be best known for its hive temperature sensors, but for my money you get the most bang-for-your-buck out of the scale, called the Broodminder-W. It’s pretty easy to use for anyone with a smart phone. And while it’s not cheap, most beekeepers can get all the data they need out of a single scale—even if they have more than one hive. That’s because one scale in a bee yard will show whether there’s nectar coming into the hives. This is very useful when deciding when to add honey supers, and can keep a beekeeper from missing a honey flow in the spring. In the summer a drop in weight signals when to remove supers and avoid feeding them back to the bees during a dearth. $179 plus shipping.